Did you get a chance to watch the debate between Billy Nye and Ken Ham Tuesday night? Our family did and I am glad they got the chance to witness it because there were so many great lessons to be taught that night that made it valuable not just for homeschooling families but also for Christians period. I believe that whenever a Christian gets an opportunity to share God's Word, especially on a public platform to millions the way that Ken Ham did that night, it was a win for kingdom. It was an opportunity for the truth to fall on the ears and souls that needed to hear it proclaimed. I also love that my children got to witness a man unashamedly defending the faith but yet doing it with patience, grace and presenting his case professionally. He was well prepared and did not have to resort to tactics to prove his point like we might see in other debates, instead he kept with the Word of God and kept bringing it back to the Bible. Another thing that shined through was his humility. He was not boastful and did not seem to ooze of pride or look down on Bill Nye. I believe he knew that he needed to be gracious because He was handling God's Word and because Nye needed to hear the Gospel which was just as important than the debate at hand. I am grateful for men who still defend the faith and greatly desire to raise my sons and daughters who to be able to do the same. We talked much afterwards about how a Christian needs to share the word today but do it in love and in grace so that their hearers will listen. Afterwards, I had the children write a paper on the debate to share what they learned and their conclusions. I know that not everyone agrees with a young earth, and really only the Lord knows the exactly how old it is--however, I am still grateful for the chance to use the debate as part of their schooling for critical thinking and further analyzing. By the way, if you did not get a chance to view the debate you can view it here for FREE a limited time or get a copy for your home or church here. 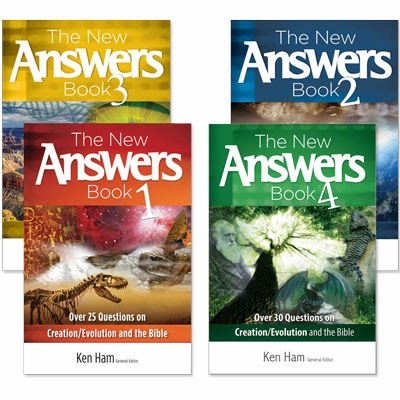 I stopped by the Answers In Genesis store to look around since I hadn't been there in a while and found that they also have MANY wonderful new resources (including homeschool curricula, Sunday school resources, and so much more). I definitely want to pick up more materials for the kids for school this year and just for leisurely reading, especially since it is so hard to find wholesome, educational resources from a biblical perspective today. 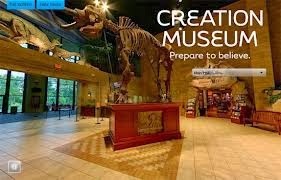 I also wanted to mention that we were blessed to visit the Creation Museum a few years ago and hope to visit again soon. I highly recommend it to anyone who hasn't had a chance to get out there yet. They are having a special for the entire year of 2014 that children ages 12 and under get free admission, you can read all the details HERE. What did you think of the debate? Leave a comment with your thoughts or join our conversation on the topic over on Facebook. Note: Our affiliate links were included in this post that go towards the growth of this ministry, thank you for your support! I love your blog, love your style! I am , however, a practicing Catholic who believes in "Intelligent Design" and I find this discussion somewhat exclusionary in social media ---it seems assumed that all Christians believe as Ken Ham and his followers and that is so not the case. Yet I find it very sad that Bill has no faith in his life and I will pray for him to see the Light in this life before it is too late.....conversely, though I disagree with Mr Ham on the age of the earth, I think that the fact he is talking about the Word is amazing. In our culture, it's awesome !And it may just plant seeds that will open hearts to non believers. My dh and I have multiple science degrees and my dh is a geologist, yet is a devout Catholic. It's kind of troubling to me that many who believe as Hr H do, that we will not be saved bc we believe as we do. I intend this with all due respect, bc I find you smart, inspiring and a downright amazing woman. I disagree with the general philosophy but love how you presented the debate here! Thank you! I really enjoyed the debate. Well, at least anytime Mr.Ham spoke lol (I found it hard to listen to Bill Nye, but I listened anyway out respect for Mr.Ham and him working so hard to set up the debate). I loved when Mr.Ham boldly proclaimed that creation was not only a viable model of origins, it was the only viable model :D Mr.Ham was so gentle, yet very bold! To be honest I was so disappointed with Bill Nye, he seemed confused to say the least - all he did was throw out operational Science examples with the attitude of: Ta da! I've beat creation....completely ignoring Mr.Ham showing that operational science is NOT synonymous with evolution, and that people who do not believe in evolution can do science - because what is at odds, is not how computers are built but how we and the raw material for our technology came to be in this world in the first place and that the "who, what, how, when, where & why" is where scientists differ but Nye refused to get it :( Over all for constantly asserting creationists aren't real scientists and that creation hurts the world, he never gave any prove or evidence for his stance nor refuted Mr.Hams evidence to the contrary, it was just sad. I also loved Mr.Hams response: "there is a book.." whenever Bill Nye couldn't answer an audience members question :) What it seemed to me from watching the debate is not that Nye like following evidence or discovering new things, what he really enjoys to put it kind of blunt: is the joy of ignorance - he likes not knowing things (even though he asserts to be a science authority), he likes the pleasure he gets from the "answers" still being out there, because deep down he understands that if all the answers are found he'll lose his mission in life, which is searching for those answers - so even though he knows the Bible can answer his questions, even though he knows those answers are real, he won't believe them. I found this fact most clear when he basically told Mr. Ham "maybe stopping at the answers in the Bible is enough for you, but I find that sad" or something like that (see the debate for actual wording of course), clearly illustrating he did not want to believe his life questions were answered. I prayed for Bill Nye during the debate and I'll continue to do so, he needs to realize its okay to let go, God is real and has plenty of other things he can discover. My olders watched wtih their Bible Bowl team, and came away with the same analysis. I asked tow adults, one well versed in philosophy and one a physician, if they felt Mr. Ham did well according to their areas of expertise, They felt that Mr. Ham did well on both scores. I completely agree and would like to emphasise myself, that how we feel about something giving for the needy people.Its a good thing that we gave something for a good cause.